Description: The curled bark of the tree. The bark, reddish brown in color, is rolled into quills, then cut to 2 3/4 inch lengths. Estimate: 100+ sticks per pound...this is not an exact count. 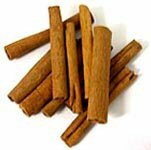 Usage: Cinnamon sticks spice ragout, rice, mulled wine, and punch.. Add to hot buttered rum, cider or tea for great sipping! Storage:Store in a cool dry place, away from heat, light, and humidity.